A problem that is common in Gouldian and other Australian Finches is baldness-feathers failing to re-grow on the head of a molting bird or, in other cases, a female Gouldian loosing her head feathers during breeding season. Balding can be caused by an iodine deficiency. Iodine is required for the proper functioning of the thyroid gland. 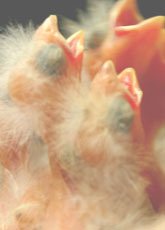 Iodine deficiency can result in poor feather condition, difficulty molting, breathing and infertility problems. 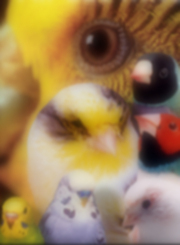 Most bird diets are deficient in iodine. When sufficient iodine is added to the diet, a full head of pin feathers reappear within several weeks. There are several ways to increase the iodine in the diet. Iodine can be provided by adding grated cuttlebone on their greens, sprouted seed or egg food supplements. Oyster shell is another great source of iodine. If this is not sufficient for the feathers to grow back then the next step would be to supplement with Liquid Iodine. 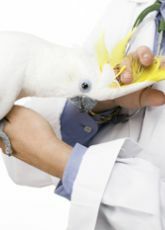 Liquid Iodine is an excellent provider of iodine in birds. 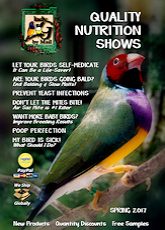 I found the safest way to supplement my birds, is with Liquid Iodine, Powder Kelp or Ioford. I always find the natural supplement to be the safest. 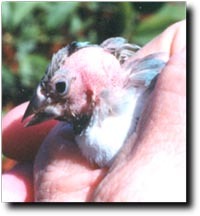 Note: If you do not see pin feathers retruning on the head within a three week period after following the dosing rates on the product lables, then iodine deficiency is not the cause of the balding. I would sugest that the balding may be caused by hormonal problems in the hens, or breeding the birds out of season.